A while ago I wrote about our visit to Barbara Hepworth's studio in St Ives, and it's been in my mind for a while to make a mosaic inspired by her great sculptures. 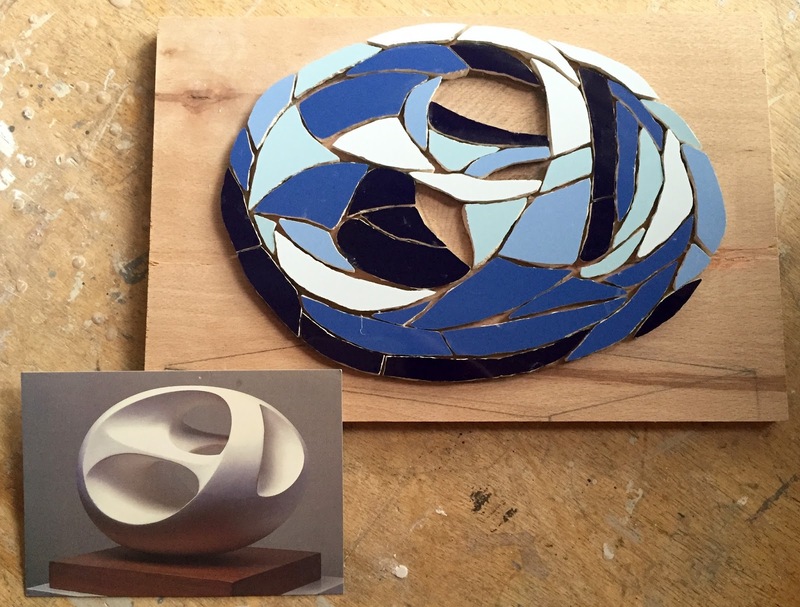 When planning this Barbara Hepworth inspired mosaic, I decided just to use one colour, and as she lived in St Ives, it had to be blue for the amazing sea and sky nearby. I collected my range of blues, chose five or six and started, trying to capture the light and shade of the beautiful shape of the sculpture. I will show you when it is finished - these things can't be rushed! 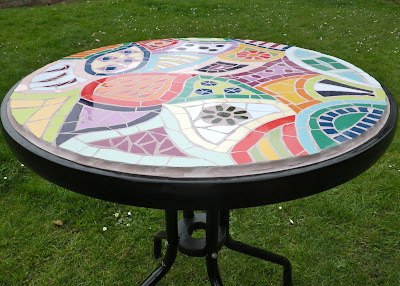 Yesterday I sent off a mosaic bistro table to a new famous customer - it was all very exciting! But MORE exciting than that was the making of the table for me. I have now fully got to grips with snipping my very hard porcelain tiles for exterior mosaics, and feel confident that as with ceramic tiles, I can create the shapes I want. 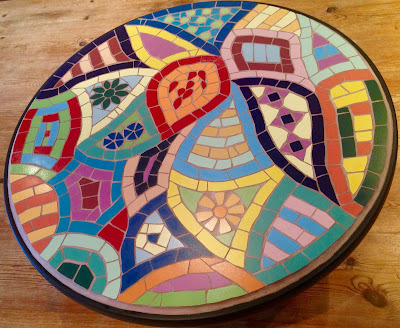 I make the table top on a thin piece of exterior plywood - 60cm in diameter. For this pattern, I like to design each section individually, and then choose my colour combinations. I love the colours in this design particularly, and see each little part as a work of art in their own right! I've made this very short Flipogram to show you how it develops - just click the link below. I have to be especially careful around the edge to make sure the tiles are even, so the grout finish is as smooth as possible. The top is then fixed to the table frame and grouted and sealed in. 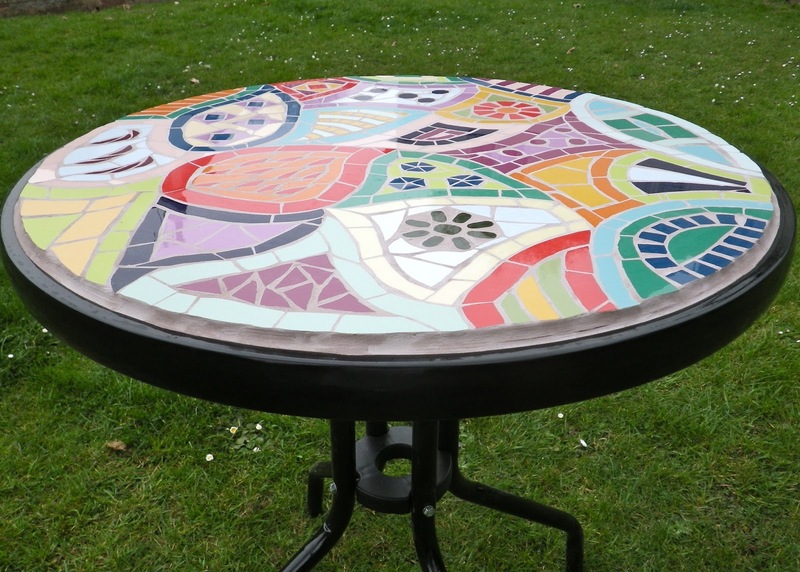 It gives me a great deal of joy to create these colourful bistro tables, knowing that they will continue to give pleasure, inside and out, for years!